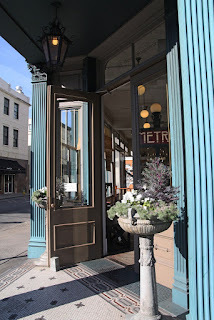 On a recent family trip to Savannah, GA, I discovered a dreamy store called The Paris Market. Don't those front doors just say "Come on in and browse around for a while!!!" So, that's just what we did. Caldrea!!!! My sister had recently told me about these products- how good they are and how fabulous they smell. I had complained to her that not one store in my area carried this. Lo and behold, there was a huge shelf full of their products!!! 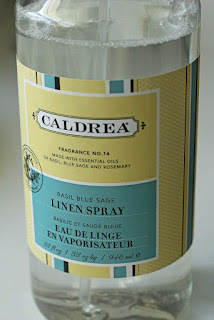 I immediately snagged their Basil Blue Sage Linen Spray and LOVE LOVE LOOOOOOOVE using it when I iron or to freshen up our sheets in the morning when I make the bed (after, of course, airing out the bed!!!)! The smell is fresh and clean and BOY do I plan on purchasing more of Caldrea's products!! Do any of y'all use Caldrea's products? If so, which ones? And do you love them?? I've been to that store! I went to Savannah with my family a couple years ago and was so excited to find such a cute shop! It sounds neat! I'm going to St. Simons shopping tomorrow, I'll have to look for some!